OK it’s cold and flu season. Now, everyone has heard of the flu. Flu, or influenza, is not vomiting and diarrhea…flu is fever, shivers, runny nose and cough. Your whole body aches. Your eyeballs 👁 literally hurt. Have you had your flu shot? I hope so! The flu shot will help protect you and can decrease the severity of your symptoms! Getting the flu shot 💉 will help protect you, and those around you 👩‍👩‍👧‍👦. Now if you lick 👅 the table or lay on the floor of the exam room when you are in the office for your shot, then you’ve likely picked up flu germs 🦠 and might be sick 😷 a few days later. This likely happened to your toddler. If you got sick days after getting the flu shot, it’s not from the shot. The flu shot did not make you sick. It’s possible you are run down and have some other 🦠 but it’s unlikely that your flu shot gave you the flu. 🥵The shot can make you feel tired or have a low grade temp, but it can’t give you full on flu! Let’s figure out if you have the flu or if you just have a cold. The flu, influenza, comes on quick. You will have a fever or chills. You will be aching. Like I said, your eyeballs 👁 will hurt. Your back will ache. You won’t want to get out of bed 🛌 . Runny nose 👃🏼 and a cough will quickly follow. The flu comes on FAST 🤧😷. Take care of yourself. The flu is rough. Rest. Don’t breathe on your friends or cough on your husband. You will regret it. The flu spreads fast. Wash your hands. 🧼 Cough in your elbow. Wash your hands. Again. Complications of the flu 🤒 can include getting another infection (secondary infection) such as pneumonia and/or dehydration. When you have the flu, get up and walk around, cough up that mucous, and keep hydrated. Warm water, lemon 🍋 and honey 🍯 will help the cough. Pedialyte for the kids, 1/2 water 1/2 Gatorade, veggie broth, bone broth or chicken 🐔 broth will keep you hydrated if you aren’t feeling up to eating. Grandma had a point, chicken soup, veggie soup, a warm blanket and rest is all you need. Stay away from cough suppressants and other over the counter medications with lots of ingredients. Keep it simple. Tylenol or Motrin for the fever. Fluids, rest and lots of tissues. If you have the flu and are at high risk – under 2 years old 👶🏼, elderly 👵🏻, immunocompromised, or have a history of wheezing, asthma or other respiratory illness– then you are a great candidate for Tamiflu. Call your provider and see if this is something you should take. Tamiflu needs to be started as soon as possible. Tamiflu doesn’t stop the flu, but can decrease symptom duration by 1 day. It isn’t a miracle drug, and for healthy children above 2 years and healthy middle-aged adults, sometimes the side effects of Tamiflu can be much worse than the benefits it gives (kids particularly hate the taste! YUCK). Remember, if you don’t have a fever, you most likely don’t have the flu! The common cold, a virus 🦠, generally comes on slower than influenza. You might start with a runny nose 👃🏼 and a sore throat😧. Your toddler might sneeze🤧 and start with a junky cough. A low grade fever 🤒 may start a few days in. The cold symptoms should last a few days and then you will gradually start to feel better. But for any illness… If your fever lasts more than 4 days, if you aren’t taking enough fluids and you’re getting dehydrated, if you or your child are out of it and lethargic, or if you have severe pain or trouble breathing, it’s time to get checked out. ASAP. When a cold or fever is worsening, kids will start to breathe heavily. They may start to breathe fast. What you will notice is a change, and then it’s time for a closer look. Check your baby’s chest, are her ribs showing? Does it seem like the skin between the ribs is sucking between them? If your baby or child seems to be working hard, if his nose is flaring, then it’s time to head into the office. Anytime your baby or loved one starts to look like a wet noodle, is ill 🤒 appearing or isn’t perking up, it’s time to see a provider. Just remember, sometimes kids look REALLY bad when they have a fever…so treat it with Motrin or Tylenol and give it a little time. If the fever goes away and they still look bad, then definitely see a provider! Nurse-1-1 Health Center is written by nurses in a straight to the point type of way to provide basic health information. We get a lot of people like you searching online for answers to health concerns or looking for a hotline to ask a nurse a few questions. Questions like, I have been suffering from headache and fatigue for a while. Should I be worried? Why is my child’s poop yellow? 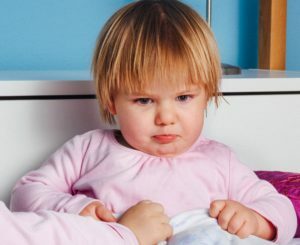 Is fever in kids bad? Well we can help. We put some info here for you to find while searching through all that other dry, scary medical information online. Stop that. Read our posts, or chat with us. This is not medical advice or a replacement for medical care, but see what we have to say with our free health information, and hopefully it will stop you from scaring yourself any more than you already have. We can help.